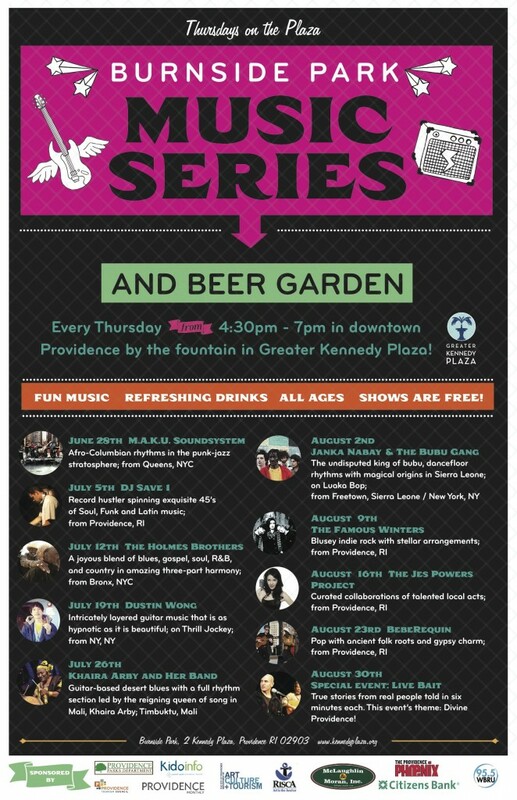 The Burnside Park Music Series and Beer Garden returns tomorrow and every Thursday through August 30th. The 2012 Burnside Park Music Series and Beer Garden kicked off this Saturday an evening of rousing performances by Bird Dog, Boo City and the Extraordinary Rendition Band in Burnside Park. If you missed the fun, don’t worry there is a full season of music ahead! Join us each Thursday evening for a free, after-work show in the park featuring inspired performances by innovative musicians from around the world. Meet up with friends new and old, relax in the Trinity Brewhouse and Revival Brewing beer garden and enjoy the park with lawn games and delicious food truck fare. Beer garden is open from 4:30 – 7pm with music from 5:30 – 6:30pm. Every Thursday, Burnside Park. Tomorrow also marks the return of the Kidoinfo Providence Storytime + Art in the park. Thursdays, 10:30am to 12:30pm. Ah, and the Greater Kennedy Plaza site is RSS’able. Just put /feed at the end of the domain. I’m glad this series continues. It restores some of what made Providence funky in my opinion.